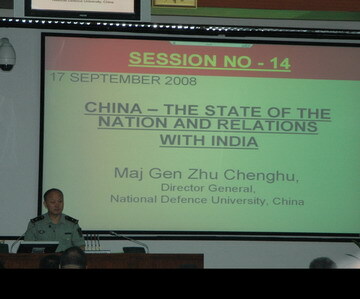 At the invitation of the National Defence College of India, Prof. and Major General Zhu Chenghu, Director General of the Research Department of the National Defense University of China gave a lecture on China's defence policy to senior officers of the Indian armed forces on September 17, 2008. He also exchanged views on various subjects with his audience. Major General Zhu is the first ever senior Chinese army officer to lecture in the National Defence College of India. During the lecture, General Zhu elaborated the basic contents of the defence policy of China, the progress achieved in the modernization of the Chinese military, especially the relations between this progress and the unswerving peaceful development approach undertaken by the Chinese people. The lecture was very well received and won approval of the audience. The Commandant of the National Defence College of India, Vice Admiral S Bhasin spoke highly of this lecture. The Commandant held a welcoming reception that evening in honour of General Zhu. Mme. Bu Jianguo, Charge d'Affaires ad interm of the Chinese Embassy and Senior Colonel Li Chao, Military Attache of the Chinese Embassy attended the reception.